One glorious spring morning, a mother duck watches her ducklings hatch. Each is exactly what a duckling should be, except for one large and very ugly duckling. 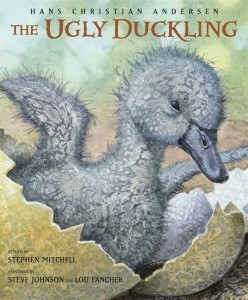 Teased by the other animals, the ugly duckling is cast out of the barnyard to make his way. He meets wild geese, a bossy hen and cat, and a noisy family—but just when he gives up on finding his place in the world, the ugly duckling makes a surprising discovery and learns the true meaning of beauty and belonging. Stephen Mitchell’s hallmark clarity and wit are perfectly paired with Steve Johnson and Lou Fancher’s whimsical collage paintings in this stunning retelling of the classic Hans Christian Andersen story. It was a glorious day in the countryside. Summer had come, the corn stood golden in the fields, the oats were tall and green, the hay had been stacked in the meadows, and the stork walked on his long red legs, chattering in Egyptian (which was the language he’d learned from his mother). Around the fields and meadows were vast forests, and in the middle of the forests were deep lakes. Yes, it really was a glorious day. There, in the sunshine, stood an old farmhouse with a moat around it, and from its wall down to the water, large burdock plants grew. The largest were so tall that little children could stand upright underneath them. It was a spot as wild as the thickest forest. Here a duck sat on her nest, waiting for her ducklings to hatch. But they were taking such a long time and she had been sitting for so many days that she was starting to get impatient. How much longer would this go on? And didn’t the other ducks realize that she would like a little company now and then? But no—they went right on swimming in the moat and having a wonderful time, and they were never considerate enough to come by and sit down with her for a nice chat under the burdock leaves. Finally, one egg cracked, then another, then another, until six of them had cracked open. “Peep, peep!” they said. The yolks had suddenly come to life, and each one stuck its little head out of the shell. “Quack, quack!” said the mother duck encouragingly, and the ducklings all crawled out as well as they could and looked around at the green leaves. The mother duck let them look as much as they wanted to, because green is good for the eyes. “How big the world is!” said all the ducklings. And certainly they had a lot more room now than when they were inside the eggs. “Do you suppose this is the whole world?” said the mother duck. “The world is much bigger than you can imagine: it goes far past the other side of the garden, right into the parson’s field. But I’ve never gone as far as that.” She paused. “Are you all out yet?” she said, standing up. “Ah, not all of you. The largest egg still hasn’t cracked open. How much more time is it going to take? I’m so tired of sitting here.” And she sat back down on her nest. “Hello, my dear. How are you doing?” said an old duck who had come to pay the mother duck a visit. “Suit yourself,” said the old duck, and she walked away. The next day was gorgeous, with a bright sun shining down onto the burdock leaves. The mother duck walked down to the water with her whole family and dived in with a splash. “Quack, quack!” she said, and one after another the ducklings jumped in after her. The water closed over their heads, but they came up again in an instant and swam around beautifully, their little legs paddling under them in the most natural way in the world. They were all in the water, and the ugly gray duckling was in the water too, swimming along with the others. When they reached the duck yard, there was a terrible uproar: two families were fighting over an eel’s head. Finally, it was the cat who got it. The ducklings did as they were told. But the other ducks glared at them and said, “Will you look at that! One more family trying to invade the yard—as if there weren’t enough of us already. And look at that deformed duckling. What a horror! We won’t put up with creatures like that.” And one duck flew at him and bit him in the neck. “The other ducklings are lovely, though,” said the old duck. “Now, make yourselves at home, my dear, and if you happen to find an eel’s head, you may bring it to me.” And so they made themselves at home. But the duckling who had come out of his egg last, and who looked so ugly, was bitten and pushed and laughed at by all the other ducks, and by the chickens as well. “What a monster he is!” they all said. And the turkey (who, because he had been born with spurs on his feet, thought he was the emperor of the barnyard) puffed himself up like a ship with full sails and rushed straight at the duckling, gobbling, his face red with anger. The duckling didn’t know where to hide. He was very sad to be so ugly that everyone in the barnyard despised him.